Suncourt does not provide electrical connection information beyond what is provided herein. To reduce the risk of fire, electric shock or injury to persons, observe all instructions. The ZoneMaster™ has been designed to operate on 24 Volt AC, 60 Hz. The only 110/120 Volt AC connection needed is for the power supply Transformer. Before installing the Transformer, confirm that the electric power is off at the junction box where you will be making the Transformer 110/120 Volt connections. Observe the following clearance to combustible materials or surfaces: For both the Transformer and the Damper electric motor: a minimum of 4” (10 cm) is required. This damper is designed to control the flow of heated or cooled air in air distribution systems only. Never close more than 20% of the air ducts leading to registers. The restricted airflow through a furnace or central air conditioner may cause failure of that equipment.This damper must never be used to control the flow of combustion air, flue gas or other toxic or hazardous gases or applications where failure of the damper can cause damage to persons, property or equipment and/or create a risk of fire, suffocation or death. • A standard low voltage Heat-Cool wall thermostat, designed for gas furnaces. • Electrical wire, 2-conductor, 20 Gauge (CL-2 or Bell Wire) to connect the Transformer to the Damper via the wall thermostat. If the total length of wire exceeds 80 feet (25 m), use 18 Gauge wire. • A cover plate with knockout for the electrical box that the Transformer will be mounted on. • If you are mounting the Damper between floor joists in flexible duct, you will need two duct supports. • Aluminum foil duct tape. little cooler than the rest of the home. The baby’s room you may want a little warmer than the rest of the home in the summertime. You control your comfort and save significantly on energy use. For metal duct, remove a 6” (15 cm) section of duct at an existing joint so you will have one crimped duct end and one straight duct end. Slide the Damper unit in place so that the ends are inserted at least 1” (2.5 cm) at each end. The Damper is non-directional so it may be installed facing either direction of the airflow. Rotate the Damper so that you can easily access the electric terminal block. Complete the installation by securing the Damper with the #6 sheet metal screws supplied. Finish the installation by covering the seams in the duct with a good quality aluminum foil duct tape. For flexible duct, cut the flexible duct and slide the ends over the ends of the Damper unit. You will need to support the Damper with a couple of standard duct supports available at Home Centers. Complete the installation by securing the Damper to the flexible duct with a good quality aluminum foil duct tape or nylon cable ties. Mark the location of the thermostat mounting hole in the back plate of the thermostat and install the fastening hardware normally supplied with the thermostat. Do not mount the thermostat on an outside wall. Locate the thermostat approximately 5’ (1.5 m) above the floor and away from drafts and direct sunlight. DO NOT screw the thermostat to the wall at this time. IMPORTANT WARNING: Locate the breaker on your house power panel that controls the 110/120 Volt AC supply to the wires in the junction box that you selected to mount the Transformer on. Use a voltage detector, volTMeter or other suitable instrument to make sure that all power to that junction box is OFF. Identify an existing wiring junction box near the location desired. Verify that the correct wires are available in this box. There needs to be: Black wire (line or hot), White wire (neutral) and a Green or bare copper wire (ground). The cover plate of that junction box must have a “knockout”. This “knockout” must be removed to make the hole for the stud of the Transformer to mount through. Thread the Transformer leads through the hole and securely mount the Transformer to the cover plate. Tighten the nut snug only. Refer to the wiring diagram below for electrical connections. It is recommended that you leave at least 1’ (30 cm) of slack wire at each component wired to ease future servicing. Run one wire from either Transformer low voltage terminal to either terminal on the Damper. terminal to the terminal marked “R” on the thermostat. to the terminal marked “W” on the thermostat. together with a short piece of wire (jumper). THE WIRING IS NOT POLARITY SENSITIVE CONNECT EITHER SCREW ON TERMINAL BLOCK OR TRANSFORMER. Connect either of the BLACK wires of the Transformer to the WHITE wire inside the junction box. Connect the remaining BLACK wire of the Transformer to the BLACK wire inside the junction box. 1. Set the switch on the thermostat marked ‘ON-AUTO’ , ‘ON-OFF-AUTO’, ‘ON-OFF’ or similar wording, to the ‘ON’ position. 2. Heating Season: Set the thermostat to ‘HEAT’. Then adjust the thermostat to the chosen temperature (e.g. 55°F). As long as the temperature in the room is 55°F or higher, the damper will be closed. If the temperature in the room falls below 55°F, the damper will open. 3. Cooling Season: Set the thermostat to ‘COOL’. Then adjust the thermostat to the chosen temperature (e.g. 85°F). As long as the temperature in the room is 85°F or lower, the damper will remain closed. If the temperature in the room goes higher than 85°F, the damper will open. Subject to the following limitations, Suncourt® Inc. (manufacturer) warrants that the ZoneMaster™ will, for 3 (three) years from date of original retail purchase, remain free from appearance of defects in workmanship or materials. This warranty is subject to the following limitations: (a) manufacturer’s liability is limited to the replacement or repair of the unit, as decided by the manufacturer; (b) a defective unit must be returned, prepaid, with proof of purchase, well packaged to avoid damage in transit; and (c) this warranty does not apply to defects resulting from the alteration, abuse, accidental damage, unauthorized repair, or misuse of the unit. This warranty is given in lieu of all other warranties, guarantees, and conditions on manufacturer’s part, and the manufacturer shall have no tortious or other liability in respect to this ZoneMaster™. Ship unit to Suncourt Inc. only after obtaining a Return Goods Authorization (RGA) number. Returns without this RGA number will not be accepted. What is a Suncourt Motorized Damper? Suncourt Motorized Dampers also known as Zone Dampers, Motorized Duct Dampers, or Automatic Dampers are mounted in ductwork to automatically shut off or open branches of the duct to airflow. They are available in normally open (power close) or normally closed (power open) configurations. What would I use a Motorized Damper for? Zone Control-Do you have a spare bedroom that you don’t want to fully heat or air condition because the room is rarely used? A Zone Damper will shut off air to that room’s registers and only allow air to flow again when temperatures in that room exceed or drop below your preset temperature. 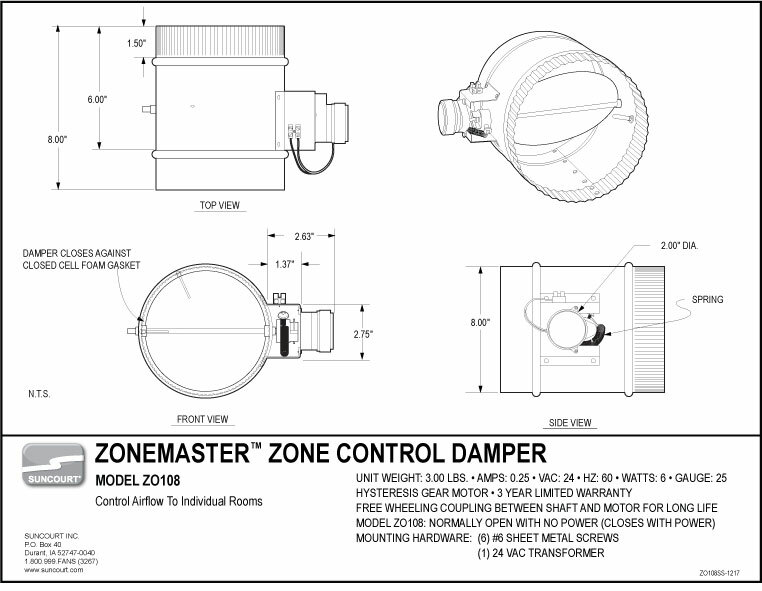 Zone Dampers are typically controlled by a thermostat or some type of master controller. Likewise Zone Dampers can control airflow to whole sections of a home or building to regulate temperature in those specific areas at certain times of the day, evening or the time of your choosing, which saves on heating and cooling bills. Ventilation-Zone Dampers can open to allow temporary ventilation of homes, garages, greenhouses, or other rooms where fresh air intake or stale air outtake is required. How does a Motorized Damper run? Suncourt Automatic Dampers are 24-volt powered and require a transformer. Suncourt® ZoneMaster™ Dampers are often installed by homeowners and have a transformer included in the box. Suncourt Pro Dampers are often installed by professionals and do not have a transformer included in the box. Automatic Dampers can be wired to 24-volt thermostats. Suncourt Automatic Dampers feature a soft-stop, freewheeling coupling between the motor and the damper shaft, which greatly improves life over other similar style dampers on the market. Suncourt Automatic Dampers feature a hysteresis motor that is designed to hold the damper closed or open with power indefinitely. Zone Control refers to regulating the temperature in one single room in your home by means of shutting air supply to that room via the ductwork ON or OFF using a wall thermostat in that room combined with motorized damper in the duct supplying air to that room. Why do I want to control the temperature in a single room? To save significantly on home heating and cooling cost. O.K. Let us say you have a room in your home that is used only occasionally, like a guest room. Why heat that room to 70°F all winter long, or cool it to 76°F all summer. Keep it at 55°F in the winter and 85°F in the summer. Same story for a bedroom. Like to sleep in a 64°F bedroom and keep the rest of the house at 70°F? During the cooling season you may want the room for the baby a little bit warmer than the rest of the house. The possibilities are endless. What are we speaking of in dollars and cents? The unused guest room you keep at 55°F. The bedroom you keep at 64°F. The square feet of those two rooms is about 15% of the total square feet of your home. Expect to save between 4% and 8% on your utility bills during the heating season. During the cooling season the savings will be even higher since cooling costs are greater than heating costs. A motorized, low voltage, damper that installs in the duct supplying air to the room you want to 'zone'. A safe, low voltage transformer to supply power for the damper electric motor. A standard heat-cool wall thermostat you install in the room you want to 'zone' (This thermostat is not supplied and must be obtained separately at your favorite home center). You will need to install the transformer on the cover of an existing electrical junction box in your home. The ZoneMasterTM damper installs in the target duct, similar to the installation of an Inductor® In-Line Duct Booster Fan. The thermostat is mounted on the wall in the target room. You run low voltage wires from the transformer to the thermostat and on to the ZoneMasterTM drive motor. Is that room going to get stuffy if I shut off the air supply? The ZoneMasterTM, with 100% airflow shut-off, can be used in dry climates and in rooms where some air exchange is present through air leakage via the windows or under the door. If you find the room getting stuffy, a small portion of the damper sealing gasket can be removed from the damper to allow some air supply. How many rooms can I 'zone' in my house? Do not use more than two ZoneMasterTM dampers per 10 heat registers. If you use more, chances are that the furnace blower will build up too much pressure. This may upset the balance of heat delivery in your home and create noise from heat outlets because the air velocity will be higher. (Same amount of air coming out of fewer registers). Computerized whole house zone control systems are available, but they are rather expensive.